Have you visited our newly expanded gift section at Oak Hill? Shop our unique, hand-curated selection of home decor and gift items featuring modern farmhouse and casual country styles as well as New England land and sea collections. New items have just arrived for Spring 2019! Browse our current flyer for great deals all year round. 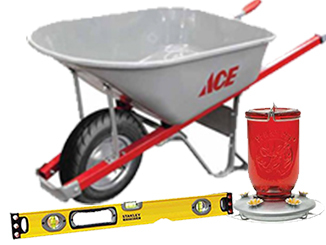 See something you like on AceHardware.com? Purchase online and have it shipped to the store for free and pick up when you’re ready. All grills are assembled for free - delivery and removal of your old grill is free (within given store radius). The best brands for the best customers! New Yeti colors have just arrived. Coming soon to Oak Hill: Traeger grills. And don’t forget to check out the Magnolia Paint collection. Not sure which color to choose? Get a peel and stick sample to adhere to the wall while you decide! We carry Benjamin Moore and Clark + Kensington paints at both locations, as well as Magnolia Paint and Cabot at Oak Hill. We are experts at color matching. We also carry Amy Howard, Krylon, Minwax, and Rustoleum products. We carry premium tools from Milwaukee, Craftsman, Stanley, DeWalt, ShopVac, Dremel, Black & Decker, to name a few. Everything you need from GE, Monster Cable, Duracell, Maglite and more for your home and commercial electrical projects. Check out our huge selection of flashlights including the latest from Nebo brand. All the newest energy-saving bulbs, and the know-how to help you pick the right one for your needs. Hot or cold, we've got you covered. Plumbing supplies from leaders in the industry like Drano, SharkBite, Fluidmaster, and Wayne Pipe & Supply Co.
Hardware? Of course we have hardware! You'll be like a kid in a candy store in our fastener room with products from 3M, Hillman, Velcro, Master and Schlage. Tried and true products from Clorox, Windex, Maine favorite Incredible Pink, eCloth, Mrs. Meyers, Scotch, and more. Lawn maintenance and garden essentials from favorites like Scotts, Miracle-Gro, Orthos, Jonathan Green, Toro, Corona, and more. Try Coast of Maine Organics including their new line for cannabis growing, Stonington. More gas and charcoal grills than you can imagine! Don't see what you want at our store? We do special orders plus assembly, delivery, and removal of your old grill (some restrictions apply). Weber, Big Green Egg, Traeger, Uuni. We know who's really number one in your family. All dog products are Rivet tested an approved. We also carry food from Blue Seal for domestic and farm animals, plus an assortment of toys and harness/collars/leashes from Planet Dog, NorthWoods, and Lupine. Seed, suet and feeders for all your feathered friends. Try local favorite Meaties - the birds will love you! Gifts? At a hardware store? You better believe it! Shop our unique, hand-curated selection of home decor and gift items featuring modern farmhouse and casual country styles as well as New England land and sea collections. Exclusively at Oak Hill Ace Hardware. We might have a short summer here in Maine but we want to help you enjoy it! We carry a variety of supplies to maintain your pool. We sell water testing kits for your tap water - just drop off your samples in our cooler and Nelson Analytical Lab will pick it up and send you the results. We are your winter weather headquarters! Shovels, sand, salt - you name it, we've got it. Stay safe and protect your home, vehicles and family during brutal Maine winters.